Divine Hydraulics is a phrase coined by George Otis Jr. and the Sentinel Group. It’s a phrase that has captured the imagination of my father-in-law and others as they contend for transformation in their communities. These hydraulics have been put on display in dramatic ways in various places throughout history. One of the occasions the effect of these divine hydraulics was seen was in 1949 on the remote Hebrides Islands off the west coast of Scotland. Concerned about the spiritual decline they were observing and looming oppressive cultural ideologies, a small group of saints began to press in to rediscover the ancient patterns that release the glory of heaven on earth in an unmistakably majestic way. These moves are marked by deep awareness of God’s holy presence and conviction of sin, leading to heartfelt repentance that leave lasting transformation in those communities sometimes for generations. Fascinated by these types of moves of God, I have found myself on a journey to understand these ancient patterns or protocols that were revealed to these saints in their desire to see the kingdom of heaven manifest on earth as in heaven. We’ve visited the Hebridean Islands, we have contended all night in prayer, we have also been part of Solemn assemblies like The Call and The Response USA that the Lord appears to be using to “teach us how to pray” and help us walk together as we understand and recover these ancient truths. We were in Cleveland, Ohio, for the most recent Response on July 16. I shoot video of the events helping document the team’s preparation behind the scenes. We were staying in the Hilton Garden Hotel within walking distance of the Wolstein Center, the venue selected for the event. Due to some air conditioning issues we were moved to a meeting room called the Armington Room for our preparations and team meetings. The team gathered the Friday before the event to pray and cover final details. I was certainly caught up in the prayer time. In three days. Cleveland was poised to be the scene of the Republican National Convention. Preparations to lockdown the city center were underway. It had been an interesting political cycle, with much concern regarding the candidates. On the news, racial unrest and violence against police officers was a constant theme, along with a brutal Islamic terrorist attack in Nice and a staged political coup in Turkey. I was glad to pray. There was a focus and intensity of agreement to the prayer time that dispensed the fragrance of Jesus into the atmosphere. As we continued to pray, I was reflecting on this pursuit of “divine hydraulics” that many others and I have been on. Believing the Lord had “another arrow in his quiver,” as my father-in-law says, were we wasting our time chasing a revival fantasy? Or were we heading in the right direction? 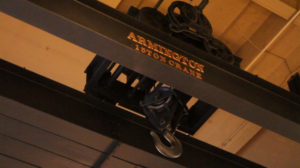 The reason the Armington Room had this name was because it was the location of the Armington Crane, which was capable of lifting 15 tons. This historic crane, which had loaded electrical power transformers, was now preserved and its name plate embossed in gold. I was intrigued by our location and stirred by the agreement of the individuals I found myself praying with at that critical time. I asked the Lord if the 15-ton inscription had any significance and felt compelled to read Psalm 15, which speaks to the heart posture of those who are given access to the mountain of the Lord. It is worth remembering that the Psalms are the prayer book of the scriptures. The five books of the Psalms are our prayer response to a conversation initiated by the Father in the five books of the Hebrew law (or Torah). Eugene Peterson calls prayer “technology” and the psalms “tools” — tools not so much for doing, but tools for becoming. Intentionally praying the Psalms, I have come to recently believe, is the key to us becoming or maturing into the people of God. The Psalms reveal the majesty of the voice of the Lord. Deuteronomy 11 is a powerful chapter given to a nation poised to enter the promised land. God is in essence saying, “If you want access to Me and the divine hydraulics, you must love Me and hold fast to Me.” The words hold fast can be translated cleave. Here we sat, preparing for The Response in Cleveland under the Armington Crane, letting God know that we were not looking to a political party or candidate for the answers we needed. But we were humbly cleaving to Him. Mike May is pastor of Pipeline Church, director of Somebody Cares Humble, and a member of TPMI’s Somebody Cares Houson network. He has produced numerous videos for Somebody Cares America and television specials for TPMI.